Unique "block" surface mount terminals achieve a reduced width of footprint, only .125" wide compared with .183" for traditional "gull wing" designs. Block terminals provide a low .200" profile and assure secure surface attachment to the circuit board. Terminals are precision-machined brass and tin-plated. Each terminal is fitted with a Mill-Max #30 (four-finger) beryllium copper spring contact. 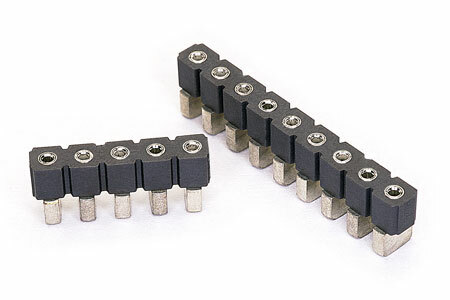 These contacts accept pin diameters from .015" to .025" as well as square and rectangular component leads. Heat-treated BeCu is the best electrical spring contact material to assure security and reliability. Insulator material is high temp. polyester (PCT), suitable for all soldering processes.